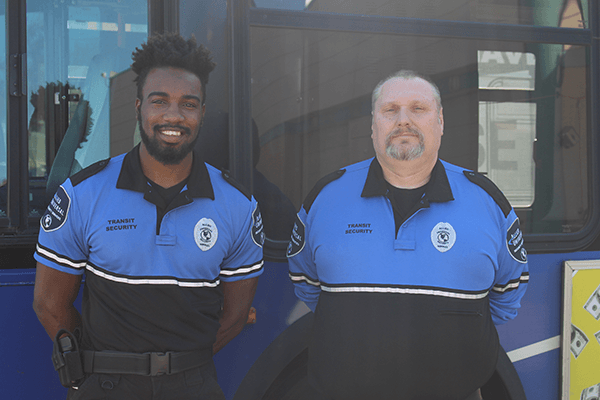 Milwaukee County Transit System Security Officers undergo hours of training to be ready to respond to any call involving MCTS buses. That readiness was critical for Transit Security Officers John Tice and Timothy Young in the early morning hours of October 2 when they responded to a deadly car accident near 35th and Capitol in Milwaukee. Police say a 22-year old driver ran a red light and hit another car. Both cars then hit a parked MCTS bus. No one on the bus was injured but two people in the car that was hit, an 11-month old girl and her 27-year old mother, were killed. As the first two first-responders on the scene, John and Timothy went to the first car and saw it was empty. When they checked the second car, they found a teenage girl hurt in the front passenger seat, an injured toddler in a car seat in back, and the mother displaced in the front seat. The two were able to free the teenager from the wreckage and took her to side of the road. Then they tried to help the baby and the mother but special equipment was needed from other first responders to get them free. Tice and Young did everything they could to help get all the car’s passengers out of harm’s way. Thank you, John and Timothy, for showing MCTS Excellence through your everyday actions and concern.